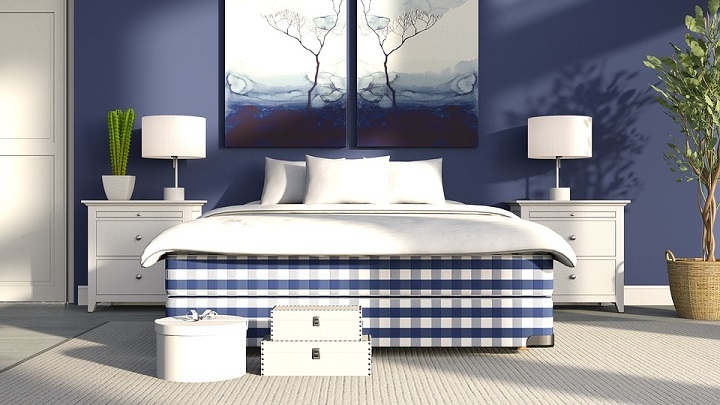 Kitting out your bedroom is about far more than a bed and closet. The small touches make a real difference and bedside table lamps help combine functionality with a design element to set off any boudoir. Today, we’ll double down on a sizeable selection of 16 lamps with an attempt to bring something for all tastes and budgets. Whether you want a cordless travel lamp, a kid-friendly reading lamp or something daintier and more elegant, read on to see which makes best sense for your needs. Once we’re done with our capsule reviews, we’ll round out with some basic pointers on choosing the best light the easy way. The Lucerna bedside table lamp from Kira Home is a stylish model that will set off in just about any bedroom and it gets our overall vote across a number of factors. There are many different styles to choose from here as well. You can also select between different base shapes (round or square), different shade colors (beige, white, or patterned), and different base colors from oil rubber bronze and matte black to brushed nickel. The lamp base is made from metal, while the contrasting lampshade is fashioned from linen fabric. The Lucerna lamp takes up less than 6 inches of space on your tabletop and stands just over a foot tall. The lamp requires a 60-watt bulb and can take LED or CFL bulbs. All options are operated by touch, making them extremely simple to use. No need for cords or switches here! There’s also a USB port that makes it super-simple to charge your tablet or phone on your bedside table as well. Brightech is known for creating beautiful bedside table lamps, and the Grace is just one of many in the broad and deep range. This lamp is elegant, modern and classic in one. It can work with any décor in any bedroom and look great. As with most of Brightech’s bedside table lamps, the Grace features an energy-saving LED light. This means that you won’t have to worry about figuring out which bulb to buy when this one burns out since it should last for upward of 20 years, giving you plenty of time to finish your bedtime reading! The solid wooden base of the lamp is square and it can be finished in a dark stain or a classic black. The shade of the lamp is also square and it’s made from a neutral colored linen. The lamp stands 15 inches tall and requires 5 inches of space on the bedside table. It’s powered with a pull cord and in the base of the lamp there’s a USB port which will allow you to charge your phone or tablet without needing to find another outlet to plug into. Perfect for little ones, this TecBoss bedside lamp is baby-safe thanks to the materials from which it’s made, such as a soft-touch silicone. In the shape of a baby chick, this cute lamp can be easily used in the bedroom of your baby or toddler. It’ll bring a smile to their face while also giving them a bit of precious light in the dark. No need to worry about this lamp keeping the little ones awake though, as the light can be adjusted to meet the needs of your child. The TecBoss Baby Night Light is portable and rechargeable. The energy-efficient LED light is a warm, soft yellow that will comfort your children as they fall asleep without hurting their eyes. At the brightest setting, the light can last 8 hours before needing recharging, while the battery will last nearly 300 hours at the lowest setting. This bedside table lamp from UNIFUN is perfect for any bedroom but might be especially useful for the kids. 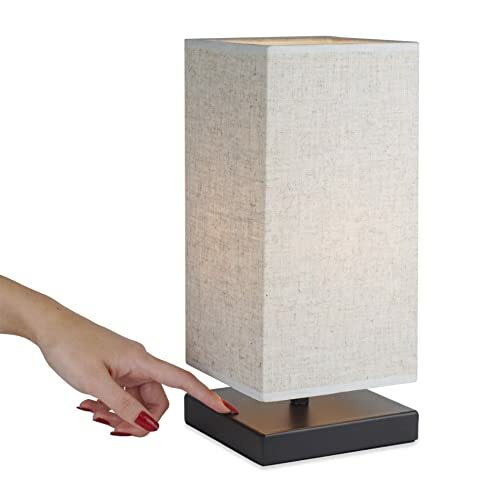 This lamp is touch controlled, removing the need for an on/off switch or a pull cord. Also, you can adjust brightness levels from a bright illuminating light to a soft reading light depending on your needs. The lamp has red, green, and blue color combinations as well. Because the lamp packs an LED bulb, you won’t need to worry about constant replacements bulbs. LED lights can last for many years without needing replaced, saving you time and money. The UNIFUN is lightweight and won’t take up much room either since it only needs 3.5 inches of bedside table space and stands a mere 5 inches high. The lamp is portable and rechargeable as well, making it even more convenient for you. Another solid Brightech model is the Noah bedside table lamp. This is a beautiful and elegant lamp with a traditional design sure to work with any decorating style from farmhouse to contemporary. The base of the lamp is made from natural wood and has an attractive black finish. The shade of the Noah lamp is made from a natural linen cloth, lending a classic touch. 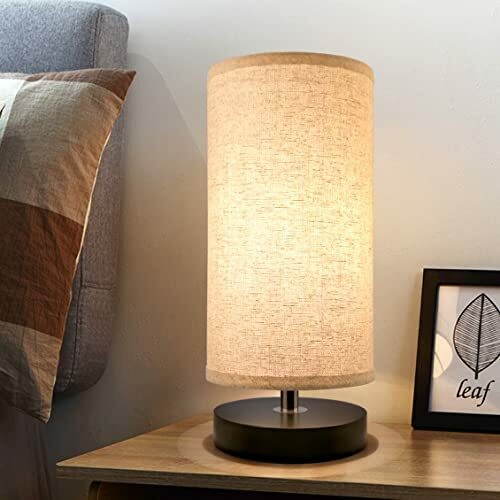 This lamp is perfectly sized for a bedside table, as the bottom base of the lamp measures 5 inches across, and when the shade is added the lamp stands just over a foot tall. No need to worry about what type of bulb to purchase when you use the Noah lamp, since it comes equipped with a 9.5-watt LED light. The light has a soft warm light and should last 20 plus years without needing replacement. The lamp is conveniently controlled by an on/off switch, or if desired, you can plug the lamp into a smart plug and control it with Alexa and other smart home hubs. 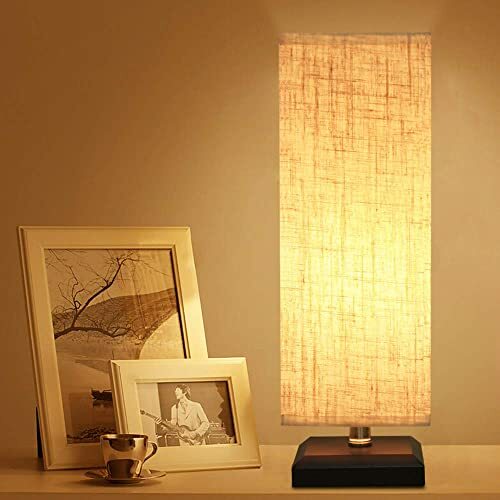 Philips has long been in business bringing light into the world, and this unique table lamp from them is the latest in a long line of innovative products. You can command the lamp to turn on or off, and you can adjust the lamp to put out over 16 million different colors of light. If you wish to use the smart functionalities of this lamp, you just need an Alexa or Google Assistant-enabled devices as well as the Philips Hue Hub. The Hue Go is wireless which makes it truly portable. Keep it on your bedside table and carry it to the kitchen with you for your midnight snack. The light in the Hue GO lasts up to three hours before it needs to be recharged. Franklin Iron Works brings us this attractive bedside table lamp that has been dubbed the Fisher Nautical lamp. Don’t let the name deter you though, because this gorgeous lamp could work in nearly any bedroom – especially those with a rustic or farmhouse type style. You can choose from a range of finishes including Fisher Galvanized, Hobie Bronze, Hugh Bronze, and Industrial Bronze. All of the lamp bases are made from metal for maximum sturdiness. The base of the lamp also features a night-light inside a glass shade that exposes an Edison style bulb. The traditional shade of the lamp is made from a linen fabric and is white in color. The base of these lamps measures 9 inches, and with the shade, the lamp measures nearly 30 inches tall, so be sure you have the room on your bedside table to accommodate them. The lamp requires a 60-watt bulb controlled by a 4-way switch that allows you to turn on either the night-light or the lamp, or to have them both on simultaneously. If you are looking for a bedside lamp that is classic while still appealing to modern design aesthetics, then the HAITRAL Bedside lamp is for you. The beautiful turned lamppost brings an air of elegance to any room but will be especially beautiful in a master bedroom or a girl’s room. Not only is this a gorgeous lamp but you’ll get a set of two lamps – one for each side of the bed – in one bundle. The base and post of these lamps are made from turned wood that has been painted white and distressed for that perfect, slightly shabby look. The lamps are finished with off-white pleated fabric shades. The lamps stand about 18 inches tall and will need just over 4 inches of space on the bedside table. They use a 60-watt E26 bulb, and the lamps are controlled by an on/off switch on the cord. This beautiful bedside table lamp from ZEEFO features a cylindrical design made from crystals. The aesthetics of this lamp would work well in a glamorous style room, or to add a pop of fanciness to an otherwise plain room. Just about every 12-year-old girl would love this crystal lamp from ZEEFO in her room, and it’s easy to see why. The lamp base and shade are both circular. The base is made from an attractive chrome while the shade is made from spaced crystal. Don’t let that make you think this lamp is fragile though, it’s actually surprisingly robust. You won’t need much space to accommodate this lamp either, as it needs less than 5 inches of tabletop space and stands a mere 11 inches tall. The cord is long and thick allowing for freedom of movement married to excellent lifespan. The lamp requires a 60-watt E26 bulb and the lamp is operated by an on/off switch on the cord of the lamp. This lamp is indeed suitable for your bedside table and will look beautiful in any setting thanks to its modern design. 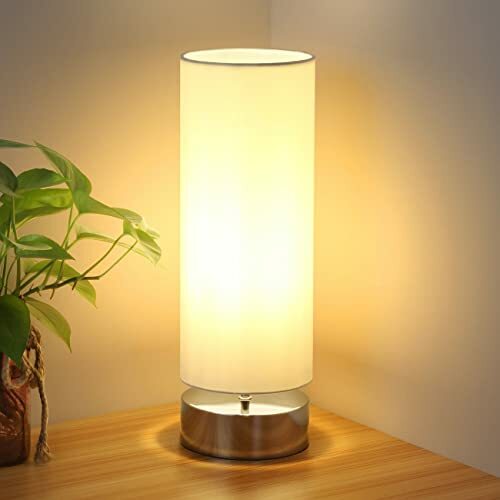 This lamp however, is set apart from the others because it’s rechargeable and portable, allowing you to take it around the house or on the road. The wireless design also gives you peace of mine knowing that no one will be tripping over or getting tangled up in the cord. This lamp is operated by touch sensor, but the sensor also allows you to control how bright the light emitted from the lamp is. There are no preset levels of light, it’s all left up to you to decide. Requiring less than 5 inches on your bedside table, and standing just 10 inches tall, this lamp is a fantastic choice for those among us who don’t have a lot of space. ZEEFO makes another appearance with just cause. 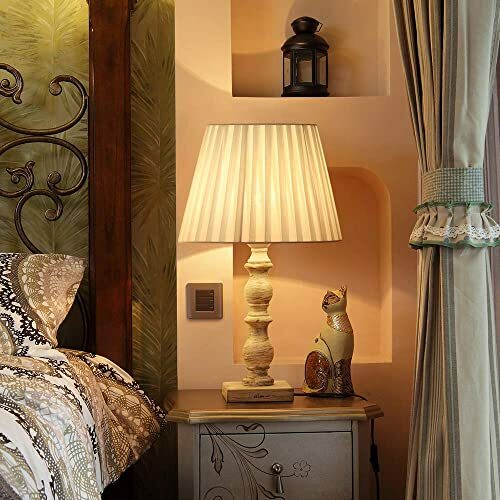 The bedside table lamps made by this company are top quality and extremely affordable. This retro style lamp is perfect for the bedside table in the master bedroom, the nursery, the guest room or the kids’ room. Featuring a simple design, the ZEEFO can work in any space, providing a glowing light in the room for years to come. The base of this lamp is made from wood cut into a square shape, and it will need less than 5 inches of space on your bedside table. When the attractive fabric shade is added to the lamp base, this ZEEFO lamp stands around a foot tall. The lamp’s power cord reaches roughly 5 feet, and there’s an on/off switch on the cord that operates the E26 60-watt bulb. This bedside table lamp from Aooshine is a beautiful option and features a minimalist design that can be stunning with any décor. While minimalist design is currently very much in vogue, this lamp will look great for years to come, no matter what direction home styling takes. The base of this lamp is crafted from solid wood cut into a circular shape. The lamp’s shade is made from linen fabric that is also cylindrical. The linen shade will soften the light coming from the lamp, allowing you to enjoy a comfortable light level in your room. To ensure you have enough room on your bedside table, you should account for the measurements of this lamp. The base will take up around 5 inches of space, and with the shade the lamp stands a foot tall. The cord will reach a little over 5 feet as well allowing for options with placement of your lamp. The lamp requires a 60-watt bulb, and it’s powered by an on/off switch. If you have a hard time sticking to a color choice, then this Limelights LT2024 Bedside Table Lamp might be the perfect choice for you! 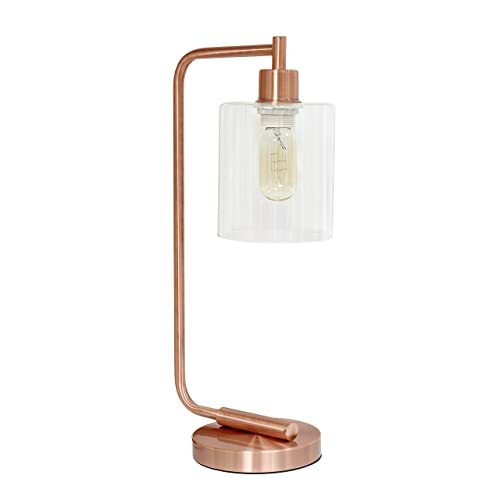 This lamp is a great addition to the bedside table in any bedroom, from nurseries, to kids’ rooms to adults. The base of the lamp is an attractive brushed steel and it will need around 9 inches of table space. With the shade, the lamp stands around 20 inches tall. The technologically inclined user will appreciate the two-prong built right into the base of the lamp – no need to find another outlet to charge your phone or tablet on your bedside table! The lampshade is where the fun comes in! Available in more than 12 different colors, from a fun teal or jewel-toned purple, to a neutral gray, beige or white, there’s a color to suit any style or theme. The lamp uses a 60-watt bulb and is operated with a pull chain. 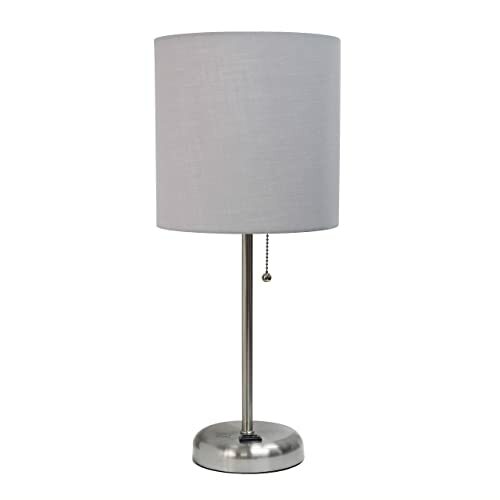 Seaside Village brings us this modern design lamp that will look great on the bedside table in any bedroom. Done out in an attractive minimalist design, this lamp is sure to please even the pickiest person. The base of the lamp is finished in black nickel while the shade is cylindrical and open at the top. The lamp stands nearly 18 inches tall and will require about 6 inches of space on the nightstand. The power cord can reach up to 59 inches as well, so no need to rearrange the whole room to accommodate the lamp. Allowing for more user control, this lamp model features four settings to provide lighting for reading or in order to allow for soft mood lighting. The lamp uses a 6-watt bulb, and the manufacturer provides one with purchase. No need to worry about knocking the lamp off the table in the middle of the night trying to find the switch, either. This lamp is operated by touch, making it very user friendly. Antique, shabby chic, industrial: all these design elements that are very trendy right now but have also withstood the test of time. With this Bronson style nightstand lamp from Simple Designs, you’ll have a lamp that looks great now and will last for years without dating. Standing almost 19 inches tall and taking up around 7 inches of tabletop space, there is plenty of room for this lamp on your bedside table. There are multiple colors to choose from including black, white, rose gold, and chrome. The lamp base is made from strong material like iron or copper depending on your color selection. The 5-inch diameter shade is made from glass and is entirely see-through allowing you to use a unique Edison style bulb to amp up the style. The lamp uses an on/off switch on the cord which controls the 40-watt bulb that will illuminate your room. Ashley Home’s Signature Design Line brings the NYX Sports Fan Lamp which is sure to light up a smile on the face of any young sports fan in your world. 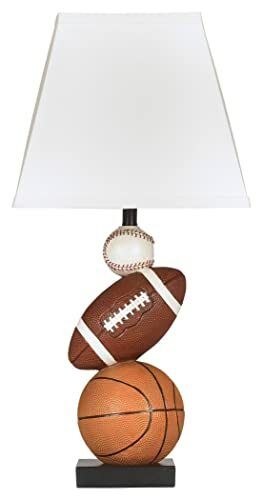 Featuring a stacked baseball, football and basketball motif, any young player will enjoy having this lamp on their bedside table. The lamp is made from a sturdy polyresin so no worries about breakage when hit by a flying ball! It stands nearly 2 feet tall and will take up about 12 inches of space on the nightstand. The shade is a modern square shape done in a light fabric to allow the light through without being too bright. The lamp uses a 60-watt type-A bulb that can be controlled with an on/off switch. Give your little slugger the look they are going for with this fun NYX Sports Fan Table Lamp from Ashley! You might think buying a bedside table lamp is the easiest job in the world. While it’s in some ways not a complex decision, there are nevertheless a few key elements you should bear in mind to make sure you get the right lamp for your needs. Before you launch into the specifics of any given beside lamp, you should take a few moments to consider its intended purpose. Are you primarily looking for a reading lamp? If so, look for a lamp with a higher wattage and more powerful bulb. You should also consider a lamp that’s easy to switch off without needing to get out of bed to do so. Do you want a lamp that serves more of an ornamental purpose? If this is the case, you should drill down more on design and overall aesthetics than functionality. Is the lamp intended for use in your kids’ bedroom? Make sure you choose something robust enough to last the distance. Can it withstand a little rough and tumble? Is the cord a trip hazard? Clearly, place safety issues uppermost when buying a lamp for your children. What makes a great lamp downstairs on the kitchen work surfaces might not make the best fit in the bedroom. Think about the footprint of the lamp you’re thinking about buying and also make sure it’s in proportion to the space where you’ll be housing it. Perhaps you want a lamp in the bedroom but you don’t intend to place it on the bedside dresser. In that event, you’ll have more freedom to choose something slightly larger. You should not overlook power outlet placement either. Think about where you have space for a lamp without needing to rely on extension cables. What type of bulb do you want? Older CFL and incandescent bulbs work well enough but they’re not very energy-efficient. Modern LEDs are by far the most versatile, user-friendly and economical option at your disposal. LED bulbs last anywhere from 20,000 to 50,000 hours before you need to replace them. With LEDs, you’ll also get increased efficiency so you’ll get comparable light to a much brighter older style of bulb without using more electricity. A shade is crucial if you don’t want the harsh glare of an exposed bulb. Take the time to consider the style and material to make sure it not only does its job but looks the part at the same time. Do You Need a Smart Lamp? More and more bedside lamps come with smart functionality. 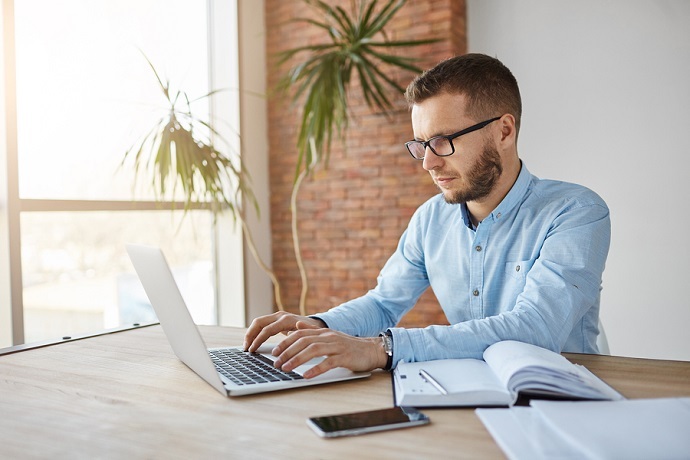 The first question to ask yourself is whether you really need this or whether you’d be paying for unnecessary features. With a smart light, you’ll be able to use your favorite digital assistant to turn the light on and off or make adjustments to the brightness levels using nothing but voice commands. In order to make this happen, you’ll need an Echo device (for Alexa) or a Google Home device (for Google Assistant). Siri calls for HomeKit-enabled devices like Apple HomePod. With these smart speakers – and, sometimes, a third-party central hub – you can enjoy all the convenience of controlling your lamp in-app on your cell phone or with voice commands. Only you know how much of a premium you place on the appearance of a lamp. This should probably not be the primary factor you base your decision on but there’s no denying that aesthetics count. And, with such a huge array of lamps on the market, there’s no excuse not to get one you don’t like the look of! You should by now have a clear idea of which type of lamp would best fit your bedroom and a shortlist to work from. While choosing a bedside lamp is seemingly simple, it pays to examine the pointers in our above buying guide to maximize the chance of getting the right form of lighting for your needs. Drop us a line if you have any questions or feedback at all. We love to hear from our readers and we’re highly responsive to messages. Don’t forget to follow us on social media, too. And most importantly, bookmark our blog and come back soon. We’re just polishing off another collection of vacuum cleaner reviews as we continue our quest to bring you nothing but the best products to fill your beloved home.